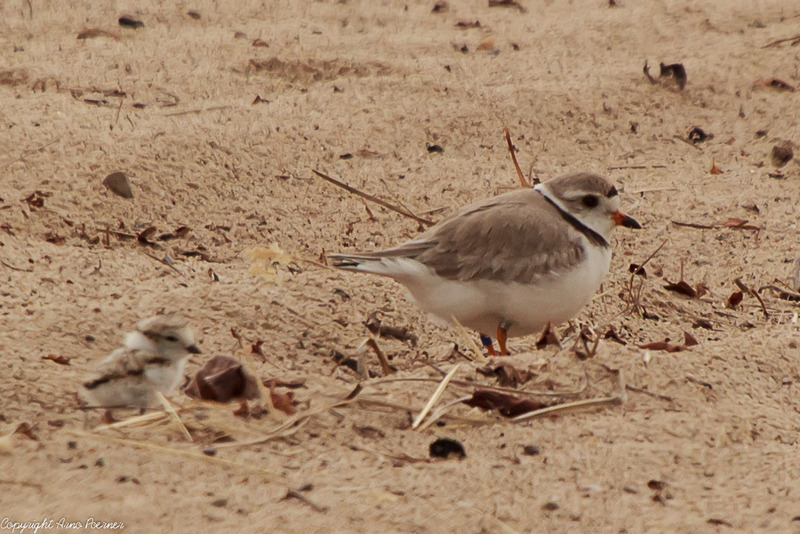 Piping plovers look like a small, pale killdeer with a single dark breast stripe. Their preferred habitat is a wide, sandy beach along the Great Lakes shore in areas that have scant vegetation and scattered stones. Their nesting territories often include a small stream or interdunal wetland. Piping plovers lay four eggs in a small scrape on the ground and depend on the coloration of their eggs and feathers for protection. 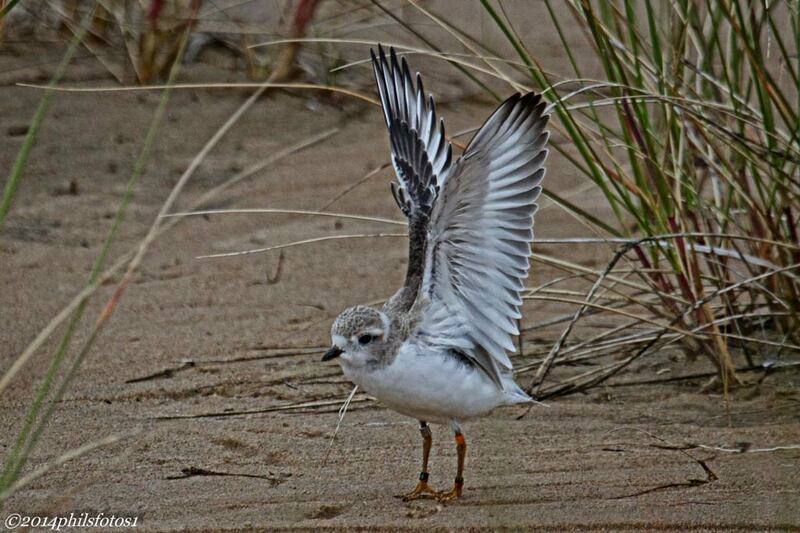 Piping plovers are an endangered species in Michigan. They winter on the Atlantic and Gulf of Mexico coasts. Great Lakes Plovers winter along the Atlantic and the Caribbean Islands. 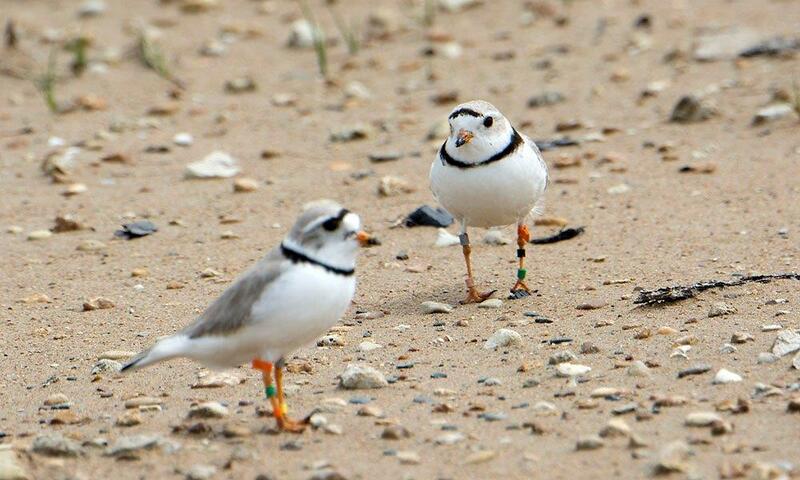 The following article was prepared and presented by Peggy Ridgway, Local Piping Plover monitor coordinator. It was an interesting, challenging, sad, yet rewarding, 2014 season! Six plover nests were established. Three were located at Tawas Point and three in the AuSable/Oscoda area near the mouth of the AuSable River. 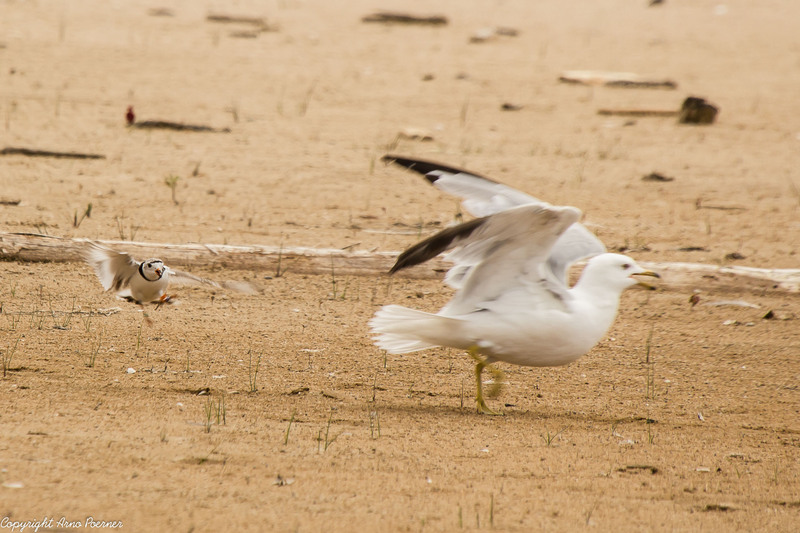 The three pairs in AuSable/Oscoda zone were first year inexperienced birds and encountered many obstacles, as often is the case. One pair nested right smack in the middle of the location of the annual 4th of July fireworks. Working closely with plover monitors, U.S.F.W.S., township officials and maintenance crews, the town folks relocated the “works” to a jetty at the mouth of the AuSable River. Unfortunately, despite the cooperative attempts by humans to accommodate the birds, both pairs south of the river mouth abandoned the nests a few weeks into incubation. Researchers are still puzzled about the sudden departure of both pairs. None of those retrieved eggs survived. The pair nesting north of the river mouth (first time documented) lost all four of the two week old chicks to a large unleashed dog that roamed the beach. All of the Tawas birds were returning adults from previous years. Among them was “L’Oreal”, a female who had frequented the location for the past 4 years. Sadly, her former mate, “Lancelot”, had developed a leg infection on wintering grounds and was not able to survive the spring migration. Consequently, she paired up with a prior resident of the Point, and produced four eggs. Unfortunately, a week or so into incubation, L’Oreal succumbed to predation by a fox. However, her four eggs were retrieved and taken to the captive rearing facility at the University of Michigan Biological Station in Pellston. All four of those eggs hatched and in late July the chicks were released in the U.P. at Grand Marais. Another nest nearer the middle of the Point also was predated on by a mink or weasel. All four eggs were lost. George and chick, from our successful nest of 2014. On a positive note, one returning pair (George & Martha), who had not been successful at the Point last year (nest wash out), rallied and raised four chicks who also fledged. These four were the only known fledglings on the American side of Lake Huron! One of G & M’s chicks testing wings at fledge time. At the end of the season the state wide count of breeding adults was 70 pair (an increase of 3 pair over ’13), 81 nests, 104 chicks fledged and 24 captive reared and released chicks. Many thanks to the University of Minnesota researchers, their field staff, state wide volunteer monitors, and local citizens who continue to keep a watchful eye on this unique federally endangered species. The following is a (true) story of how we can see the fruits of our labors when we reach out and volunteer. During the summer of 2011 one banded female federally endangered Piping Plover chick remained on the shores of Lake Huron at Shoreline Park near Oscoda, Michigan. She was days away from fledging, but the annual 4th of July fireworks were scheduled to take place the exact beach location where she and her male parent foraged. US Fish & Wildlife personnel and local plover monitors alerted township officials of the precarious situation. They requested that the display be moved 300 feet to the north to avoid possible negative impacts on the chick and guarding adult. With a limited time constraint, local authorities, fire and police departments concluded that this could be done and made the quick decision to relocate the fireworks as requested. Much to everyone’s delight, the chick fledged on the 7th of July and soon departed for unknown destinations. In the spring of 2012 she returned 10 miles to the south at Tawas Point State Park. She and her banded mate successfully raised another 4 chicks. It was decided to name her L’Oreal because she was worth the community cooperation and efforts to protect her the previous summer. In 2013 L’Oreal returned with the same mate and raised another 4 healthy chicks. Monitors named the male Lancelot because of his protective nature and loyalty to L’Oreal. In mid-July L’Oreal was spotted on Cumberland Is., GA. This is the same location she spent the winter of 2012! In August Lancelot was observed 25 miles to the north Georgia coast on Wolf Island. 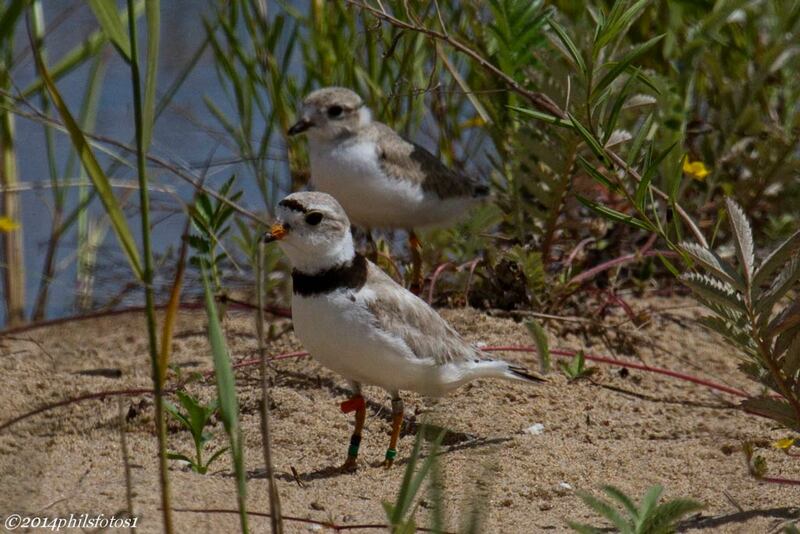 Hopefully this pair will return to Tawas in 2014 to successfully raise another brood of healthy plovers. 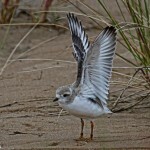 For the second time in two years, the endangered Piping Plover nested on the shores of Lake Huron. 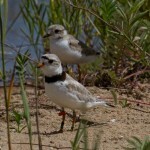 Three successful nestings occurred, one near Shoreline Park in Oscoda and two at Tawas Point. Moreover, these were the only known three sites on the American side of Lake Huron ! The Great Lakes population was listed as endangered in 1986. Through careful conservation practices, public education efforts, and support from private land owners, people are helping these birds to make a comeback! We have a long way to go, but we’re on our way. Our October 9th meeting will feature guest speaker Vince Cavalieri from USFWS who is the Great Lakes Piping Plover Coordinator. Vince visited our area many times during this season and has lots of stories to tell. Many thanks to the AVA members who helped monitor the birds in both locations throughout the summer. We have a success story! Much appreciation to AVA members Roger Eriksson, Arno Poerner, and Lynn Bitterman who captured some great plover images on camera. 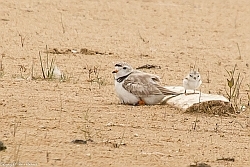 Adult Piping Plover and Chick at Tawas Point State Park.